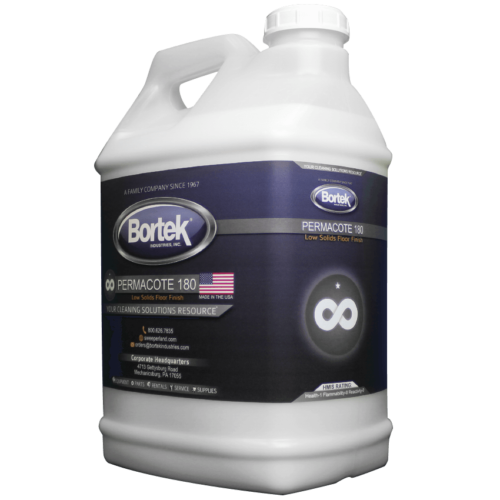 Permacote 180 is a low solids, metal cross-linked acrylic floor finish which will generate excellent initial gloss and durability. It’s durable enough to withstand daily traffic, yet can be spray-buffed as well. A metal cross-linked, acrylic floor finish with high initial gloss and durability. Excellent for schools and institutions. A true workhorse in any maintenance program. Dries to a hard durable finish that withstands daily high traffic yet responds well to low or high speed spray-buffing. 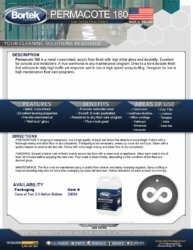 Designed for low or high maintenance floor care programs. PREPARATION: If stripping is necessary, use a high quality stripper and follow the directions accordingly. Follow with a thorough rinsing and allow floor to dry completely. If stripping is not necessary; sweep up loose dirt and dust. Clean with a quality cleaner to remove dirt and oils. Follow with a thorough rinsing and allow floor to dry completely. FINISHING: Spread a liberal coat of finish evenly across the floor with a clean mop or applicator. Allow each coat to dry at least 30 minutes before applying the next coat. Five coats is ideal initially, depending on the condition of the floor and desired gloss. MAINTENANCE: The floor may be maintained using a quality floor cleaner and damp mopping regularly. Spray buffing or mop-on restoring may also be done after sweeping up loose dirt and dust. Follow directions for each product accordingly. 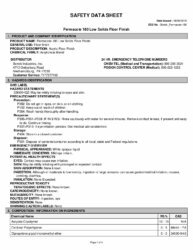 Coverage 1800 – 2200 ft2 / gal. Dry / Recoat Time 30 minutes min. Weight per Gallon 8.58 lbs./gal.